Our first trip with Grand Circle was the Great Rivers of Europe river cruise from Amsterdam to Vienna, in September/October of 2018. We had not planned to do another overseas trip after our Tanzania-Serengeti safari trip in July, but Grand Circle made us an offer that was hard to refuse. We had free air travel, a significant discount on the trip price, plus credits from the safari trip and additional credit for a second trip in one year (our safari trip was with O.A.T., a subsidiary of Grand Circle). As we got to know our fellow travelers we were amazed to find that most had traveled with Grand Circle anywhere from three to fifteen times. We were also very impressed with how G.C.T. handled everything, especially when things didn’t go as planned. We had been warned ahead of time that the water levels in the Rhine and Danube rivers were lower than usual and if they didn’t get some more rain there was a chance our itinerary would need to be adjusted. The day before we left we learned that there had been no relief, and our ship would not be able to get to Amsterdam where we were to have embarked on the cruise. Instead we stayed in a Marriott hotel for two nights and then traveled by bus to meet the ship in Rüdesheim, Germany. Later in the trip we were informed that the Danube water level was too low for the ship to navigate to Vienna, so we also had two days of bus and hotel accommodations at the end of the trip. This of course was less convenient than unpacking once and staying in the same cabin for the entire trip. However, we were pleased to learn the itinerary was arranged so that we would still visit all of the same cities and attractions as originally planned. In addition, we were compensated financially by G.C.T. with partial cash refunds, extra-cost optional activities made free, and additional credit for future travel. Clearly customer retention is a high priority. Our ship had 145 passengers divided in to four groups of varying sizes, each with a dedicated program director. Our group of 45 was led by Amir from Austria, who was incredibly knowledgeable, humorous, well-versed in the local history and culture of the places we visited, and very helpful. This was my first experience of being part of a group following a tour guide with a flag, something I might have scoffed at in my younger days. However, we found it to be a much richer travel experience hearing about all the history and local insights of each of the towns and cities we toured. In a few cities the local ordinances required us to use local guides, and all but one of those were also outstanding (one was just okay). We enjoyed both on-board and on-shore entertainment. Much of it was educational, such as a demonstration by a glass-blower in Wertheim and a sausage and beer tasting event, both on-board. One of the more moving events was a talk by a young man who had fled his native Syria after his village was bombed into oblivion, spent time in a Turkish refugee camp, and traveled with people-smugglers to Vienna where he now resides and studies. There was also a good variety of pure entertainment including a hilarious concert by the ship staff, and a resident on-board entertainer. There was always something to keep us occupied! 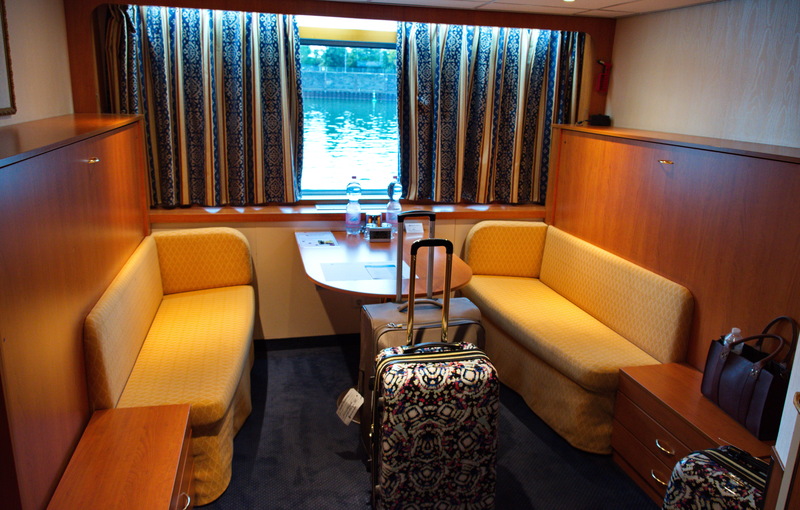 Our ship, the MS River Adagio, was nicely furnished with a comfortable lounge and an impressive dining room. Our cabin was small but well designed. All the cabins on the ship have two twin beds that folded up during the day to reveal two small sofas underneath, with a table in between. We would have preferred a single queen bed, but this design made much better use of the limited space. The bathroom was small but comfortable, and the shower was always hot! We were on the middle deck, with a large picture window. The lower deck cabins have small windows just above the water line. The upper deck cabins have balconies, but those cut into the inside space, and we didn’t see anyone using them. We were very happy with our cabin choice. We were delighted with all the towns and cities we visited on this trip: Amsterdam in the Netherlands; Cologne, Koblenz, Rüdesheim, Heidelberg, Wertheim, Würzburg, Rothenberg, Bamberg, Nuremberg, Regensberg and Munich in Germany; and Melk and Vienna in Austria. The history, culture and scenery we experienced in the many well-preserved old cities exceeded all our expectations. The Rhine Valley from Koblenz to Rüdesheim is spectacular with its many castles on the hills overlooking the river. The Wachau Valley of the Danube between Melk and Vienna is also very beautiful (even by bus!). Grand Circle Travel has some of the best customer loyalty programs we’ve seen. With every trip you take you earn credits toward the next trip. Multiple trips in one year earns more credit. And as mentioned earlier, GCT takes very good care of its customers when things don’t go as planned. It was easy to see why so many of the people we met on the Great Rivers of Europe cruise had traveled with Grand Circle many times before.